You did not specify what you think is non-compliant about this installation. Which part of it would not pass down in Fla. ? That connector should have a rubber insert in it and is supposed to be watertight without the sealer, but we've always used Ducseal in this same manner. However, I don't like SEU, especially with Aluminum... Water tends to enter the hub regardless of attempts to stop it. It will corrode the terminals, especially the neutral, and if the disco is mounted directly below, the main CB and/or neutral in the disco will become corroded relatively quickly as well. I like PVC when GRC isn't needed to penetrate a roof for a mast, and I prefer to mount my discos side-be-side to the meter can. Just from my experince... Results may vary. I am a pvc guy myself but I don't see anything wrong here. What exactly is "service Entrance" cable for if not this? Would not fly here. 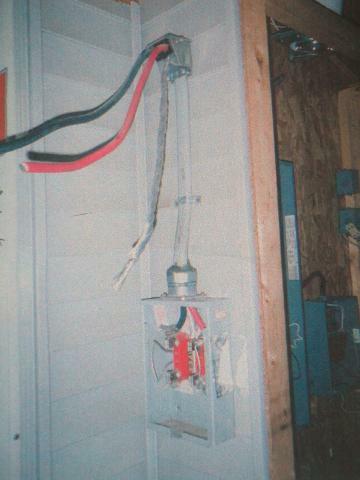 AHJ requires service conductors to be protected for physical damage. They will allow sch40 EPVC but I always use IMC or Rigid. This is common in the Phila. PA area as well. Could anyone cite code violations, please? There are no violations visible. ahah !...the 'open conductors' are passing by a window..